Bing Bong is Riley's imaginary friend, who's been out of work since Riley turned 4. He's a fun-loving, exuberant cat/elephant/dolphin made out of cotton candy wrapped around a nougat-y center. This Musical Bing Bong is a poseable 7 inch action figure. 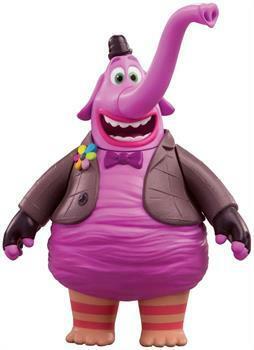 When you press his bow tie, Bing Bong sings "The Bing Bong Song" and says one of four phrases, such as "I'm part cat, part elephant, part dolphin." Bing Bong is Riley's imaginary friend, who's been out of work since Riley turned 4. He's a fun-loving, exuberant cat/elephant/dolphin made out of cotton candy wrapped around a nougat-y center. Figure measures approximately 7 inches tall. When you press his bow tie, Bing Bong sings "The Bing Bong Song"! Bing Bong also says one of four phrases, such as "I'm part cat, part elephant, part dolphin." Pose Bing Bong in different ways!